This Christmas, Terri, The Food Fairy, gifted each of her tenured head chefs a brand new Instant Pot. Initially I didn’t really understand what the hype was about, but after some experimenting, I am officially a fan. 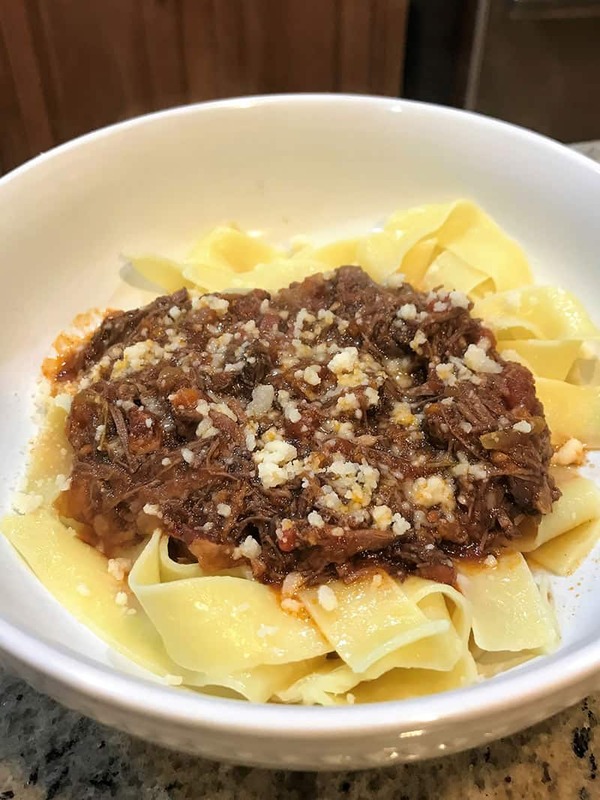 My plan for this Ragu was to make it “the old fashioned way” slow cooking in the oven. Inevitably, I ran out of time and turned to my trusty Instant Pot. This recipe ultimately took approximately 90 minutes to make, and the traditional recipe would have been more like four or five hours. The result was absolutely the best Ragu I’ve ever had. It’s a hearty dish, and it was definitely a special treat, so I have included some suggestions to adapt it to meet low-carb and low-sugar standards. 1. Set your instant pot to sauté and add the pancetta, sautéing until browned. Remove pancetta to a plate and set aside. 2. Season beef with salt and pepper to taste. Brown beef in the fat released from the pancetta, about 5 minutes. Add rosemary and sage sprigs, onion, garlic, carrot and celery. Reduce heat to medium-low and sauté until vegetables are softened, about 5 minutes. 3. Add Chianti and continue to simmer until liquid has reduced by half, about 15 minutes. Add tomatoes and their juices, 1/2 cup beef broth, and pancetta. Secure Instant Pot lid, and make sure the steam release valve is set to sealing. Set to Pressure Cook, High pressure for 30 minutes. Once the cooking finishes, release the pressure naturally for 10 minutes (just let it sit) before using quick release to let off the rest of the steam. 4. Open the lid and press the Sauté function. Discard herb stems. Use a potato masher, or two forks, to shred or mash the beef and veggies. Simmer for 10-15 minutes to thicken the sauce, stirring occasionally. 5. Place a large pot of lightly salted water over high heat to bring to a boil. 6. Add pappardelle to boiling water. As it cooks, scoop out 1/2 cup water and reserve. Cook pasta to taste, then drain well. Return pasta to pot, and add butter and 1/4 cup Parmigiano-Reggiano; mix gently until butter has melted. Add a little reserved cooking water to loosen. 7. To serve, lift pasta into each of six shallow bowls. Spoon beef ragù over top. Sprinkle the top with cheese, if desired. Substitute zucchini (or other vegetable) noodles for the Pappardelle. Use a spiralizer, or for wider noodles, use a vegetable peeler to make 4 or 5 strips end to end around the zucchini. Continue peeling ribbons of zucchini until you cannot go any further. Blanch noodles in hot water briefly (maybe 2 or 3 minutes depending on your preference). Toss cooked “noodles” with olive oil and parmesan, if desired. For a lighter dish, omit the pancetta and brown the beef in olive oil instead.